Sandhurst rainbow bella olives are lovely to use for friends popping over,l love the different colours and they taste amazing,a very good brand to buy. I love the size of these olives and the colours are just magical. What a crowd pleaser and satisfies my middle of the night cravings. Great for entertaining and easy to have in the pantry or in the fridge to serve visitors when they come over for lunch or dinner. gives a fantastic array of colour to any antipasto plate, family and friends are very impressed with this as it gives choice for those who prefer different coloured olives. 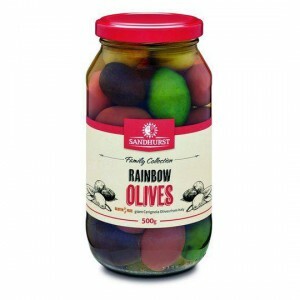 How would you rate Sandhurst Olives Rainbow Bella?